British company ARM has introduced three new technology designed to significantly improve the quality of the screens in smartphones. The first development was the display processor Mali-D71, based on a new architecture from ARM Komeda. Other technology — Assertive Display 5 — allows any mobile device to get the same experience from devices that support HDR. The third development — the memory-management unit CoreLink MMU-600. Mali-D71, known under the code name Cetus, is paired with a graphics accelerator for tasks such as rotation, scaling and image enhancement. The presence of a special module to handle the above tasks before sending the images on the screen brings more efficiency than using the CPU or graphics accelerator. The new architecture Komeda optimized for displays with 4K resolution at 120 FPS. Compared with the predecessor in the face of Mali-DP650, the new product has twice the efficiency of the region, four times higher the acceptable delay, doubled the throughput of the pixel and 30% advanced energy efficiency. All this is extremely important for augmented and virtual reality. Mali-D71 is also optimized to work with Android, including for the composition of mnogokanalnosti in Android Oreo. Optimized hardware Android reduces the load on the GPU and can handle up to eight alpha-blended, eight rotating and four scaled layers and mixed compositions HDR/SDR. Technology Assertive Display 5 is responsible for the analysis of the external lighting. In bright sunlight the screen brightness increases to a maximum value for better readability (if auto). Option adjusts every pixel in the frame and adjusts the display of colors depending on how the display and the human eye. Using the screen brightness and color of each individual pixel, Assertive Display 5 allows you to increase the visibility of dark areas, while maintaining unchanged the lighter parts. Technology also makes it possible to reduce the brightness of the screen, since the image processing is able to increase effective contrast ratio. As a result, the device consumes less energy. But the key feature Assertive Display 5 is that the function allows you to display HDR content (HDR10 or HLG) on any panel, even SDR. The image on the screen allows you to effectively handle large amounts of data. New memory-management unit CoreLink MMU-60 copes with the task much better than its predecessor, allowing the devices to reach their potential. Judging by the announcements from ARM, soon we can expect Android smartphones with 4K screens that can display content with a frequency of 120 FPS. Scientists have presented a method of reducing glare from the glass by the introduction of the material of nanoparticles. Development involved experts from the United States. Change of structure of glass at the nanoscale enables the transition of the index more smoothly and avoid reflections and glare. Super transparent nanosteklo able to reflect light in a wide wavelength range and wide angle of view. Glare is reduced so that the glass becomes essentially invisible. To create osobennuyu the surface of the glass experts used a method called self-Assembly: the ability of certain materials out of the blue to create ordered structures. In this case it was possible to create a template for etching the glass surface in the form of "forest" cone-shaped nanostructures with sharp edges. This mechanism fully eliminates glare. According to scientists, this simple method can be used for engraving all kinds of materials, at the same time taking under the absolute control of the shape and size of nanostructures that more effectively build a separate coverage. 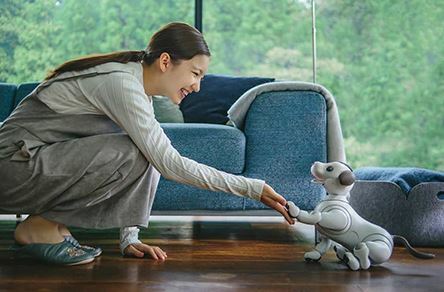 Sony Corporation has introduced an Autonomous entertainment robot dog “aibo”, which emotionally communicates with all members of the family and be educated, reports UNN, citing the press center of Sony. “The new robot dog develops its own unique personality, interacting with the owner and the environment. He shows his love to the owners due to the combination of movements of the torso, eyes, ears, tail and emits a variety of sounds voices. It has an attractive rounded shape and its body is made by unique technology "without seams"," — said in Sony. It is noted that to activate it you need to let the “aibo” to show their emotions. He can distinguish the words of praise or “enhanced voice” of the owner. The functions of the robot dogs is to learn and memorize steps, which make its owner happy. New “aibo” uses miniature actuators that allow it to move along axis 22; in the place of eyes, two OLED display that display different emotions. On a single charge Aibo can operate for about two hours, while charging the device for three hours. Along with the new model appeared and the mobile app My Aibo, with which the user can access the device settings, as well as, for example, view photos taken by your camera work. Scientists have taught lasers to compress and stretch the atomic cloud. A new way of influencing the indivisible particles was invented by the specialists from Israel. They have learned to affect the atoms using a laser beam and to change their shape. The results of scientific research they shared in the relevant edition of Physical Review Letters. Lasers have long been used to influence the individual atoms and the whole group of indivisible particles. The easiest example of the impact – the collision of the atom with the photon. The atom by the recoil is accelerated and moves in the direction of the radiation. An example of a more subtle effect on the atoms, optical tweezers. Here, the atom interacts with the electric field of the optical wave, causing the micro-particle "rolls" in place of minimum potential energy and maximum intensity of the laser. A new method, according to scientists, will allow to refract and to focus radiation in the atomic cloud in the lens. In this case, the law of conservation of momentum, the lasers will "push" to the cloud, causing it to increase in the crossmember. Experiments confirmed the correctness of researchers. Scientists conducted experiments with atoms of rubidium-87, taking the form of a spherical cloud. Million atoms caught in the "trap" and acted upon by laser radiation. The length of the laser pulse was 780 nanometers is meant that the beam was red. The longitude of the exposure was only 0.5 millisecond, and the capacity reached 8 watts per square centimeter. It turned out that the cloud of atoms, extending across, at the same time shrank in length. The hypothetical expectations of the experts was similar. The experiment also was successful, and when other factors atomic temperature and in the absence of Bose condensation. Chinese singer Chris Lee filmed the video for the song Rainy Day, But We Are Together. In the creation of this video used artificial intelligence from the US company Intel. The artificial intelligence at some point facilitated the work of the team. The survey team did not find the best angle for mounting, and the singer didn't need to carry different necessary devices. Intelligence just followed all the movements of the singer and her facial expressions. The authors of the movie while working on it trying to make it realistic. However artificial intelligence, working on the video, showed all of that in the future much easier job passing as assistant Director and operator. Also it will replace those of the Director and operators during maintenance work, thereby ensuring a great time for the creativity.